Okay, I've never been the biggest Bruce Willis fan, and I can't say The Sixth Sense (1999) changed that, but at least I know that has some acting ability. However, I think Haley Joel Osment out-acted him, and he was how old? Now, I've never really wanted to watch this movie, but it was one of those movies in a time slot for insomniacs, so I thought I'd give it a go. M. Night Shyamalan has always been one of those iffy directors, whose claim to fame was The Sixth Sense and every movie he made after that was too outlandish for critics' taste. He was also labelled ad the 'Next Alfred Hitchcock', which made me mad because no-one will EVER be as good as Hitch. So my prior opinion towards this movie was anything but excited. The Sixth Sense comes from a long line of ghosty thrillers, yet it is so different. 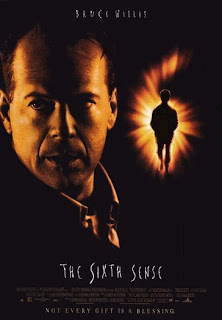 Bruce Willis plays a child psychologist, Dr. Malcolm Crowe, who decides to help the quiet kid across the street, Cole Sear (Haley Joel Osment). Malcolm can't quite put his finger on what is troubling Cole, but they become rather close. And then Cole tells him that he can see dead people, everywhere he goes, and it's starting to wreak havoc in his everyday life. The thrills in this movie come thick and fast, and though they're not particularly gory, they are very creepy. Shyamalan has crafted a perfect thriller here: you never know what's to happen next; there are some of those completely original moments (particularly the one where a young Mischa Barton appears in Cole's bedroom with porridge hanging from the roof of her mouth) which sends chills down your spine; and superb performances from Willis, Osment, Toni Colette and Olivia Williams, who each handle their characters well. It may not be a work that lives up to a Hitchcock film, but it sure is one of the best thrillers ever made.